Gogo Thule Ngane is a Sangoma Traditional Healer, Priestess, and Medicine Woman. She is guided by the Amadlozi, Elevated Ancestors of her lineage. 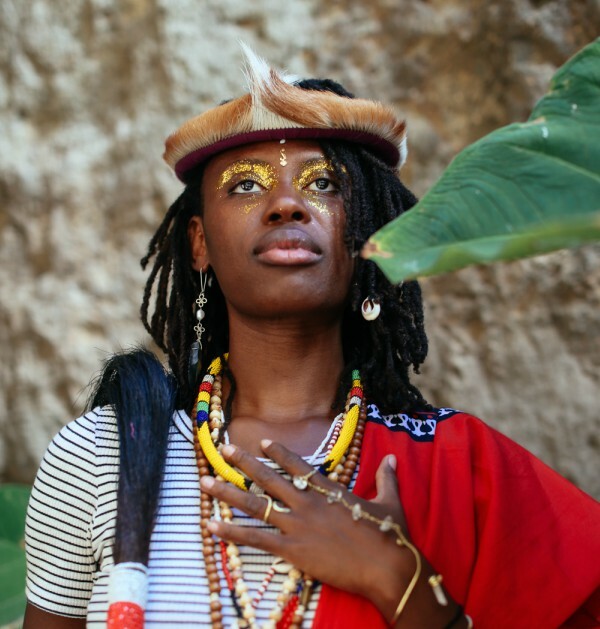 Her work includes divination, traditional healing, and leads workshops, ceremonies, and retreats on ancient African healing and spirituality. She is devoted to awakening ancestral wisdom on the earth. We have all come through challenging or traumatic experiences, emotions, and relationships but no matter what face struggle takes, I have found that the only way to true liberation is by cultivating a deep relationship with yourself, honoring your natural rhythms, desires & passions, and aligning with tools and practices that invoke and awaken your power. At a very low point of my life, my greatest transformation came through uncovering truth, healing, and power from addressing the needs of my spirit head on. It all started with a profound feeling of being lost, depression, and need to throw everything I was taught out the window in order to start over. I needed to re-examine myself and the world to make sure that what I believe and live by comes from my heart, my own experience, and true connection to spirit — not just what I had been taught by others. I wanted to heal from the pain and struggles that come with not truly feeling and knowing who we are. I deeply felt like something was missing but didn’t have the words to name it. So, I questioned, I searched, and I wandered. In 2011, I discovered that in my bloodline there were healers and that the torch was being handed to me…I was being called to learn the ancient ways of my ancestors. My lineage is that of the Sangoma Traditional Healers of South Africa. A sangoma is able to heal and lead people under the guidance of elevated ancestral spirits. We are seers, medicine women/men, & spiritual warriors. I found home and healing in practicing the ancient ways of my ancestors, in nature, in natural & holistic methods as well as in freeing my mind and life from destructive mindsets and patterns. Many of the ancient ways, texts, & wisdom have been hidden, destroyed and re-purposed but it still lives in our blood and bones waiting to re-awaken. I found medicine for the soul and my mission is to use this medicine to uplift, heal, & empower. My work is to intuitively see into your life, challenge the blockages and limitations, and offer guidance to making meaningful changes through the art of divination, ancestral rituals, and sacred ceremonies. I am here to share this medicine with you & guide you to unlocking your own inner medicine.